Joe Root was out twice in a day at the Kia Oval, dismissed both times by 19-year-olds as Sam Curran and Amar Virdi underlined their huge potential to sweep Surrey towards victory against Yorkshire. Curran took six wickets for 54 runs in Yorkshire’s first innings, when even a scintillating 95 by Jonny Bairstow off 94 balls could not prevent them from being bundled out for 229 in reply to Surrey’s 414. When Yorkshire followed on, Root’s bid to repair the second innings from 10-2 was cut short when off-spinner Virdi drew him forward with a beautiful delivery that drifted away and then turned back through the England Test captain’s gate to bowl him for 23. It was Virdi’s first wicket of the Specsavers County Championship Division One game – but his 15th of the season so far, and he is not 20 until mid-July. Virdi added the wickets of Adam Lyth, caught at slip for 58, and Harry Brook, leg before wicket for eight, to another which spun sharply. 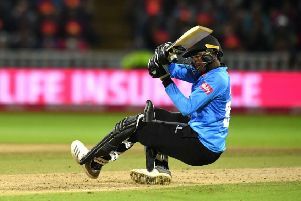 He could have had an 18th wicket of the season, too, had Ben Foakes not missed a relatively easy stumping chance when Jack Leaning, on nine, was drawn forward and beaten by another excellent delivery. Virdi’s 19-over spell of 3-52 left Yorkshire 142-5 by the end of day three, still trailing by 43, as Surrey aim to complete their first win against Yorkshire at the Oval since September 2001. Bairstow, 25 not out in Yorkshire’s second innings as he and Leaning (13 not out) put on a battling 40 in 16 overs, had strode in earlier at number six when Root was lbw to Curran for 14 from the sixth ball of day three. He then hit 15 fours, taking on the Surrey attack single-handedly. Root’s scalp was followed by those of Brook, Tim Bresnan and Josh Shaw as Curran – who had 2-15 overnight – shattered Yorkshire, who had resumed on 40-3. As he walked off the field at the lunch interval, Curran was presented with his county cap. The teenager is the fourth youngest Surrey player to be capped, after Vivian Crawford in 1898, Donald Knight in 1912 and Waqar Younis in 1990, and when he took his sixth wicket of Yorkshire’s first innings he also became the fourth youngest Surrey cricketer to take 100 first-class wickets, following Waqar, Martin Bicknell and Jack Crawford. Left-armer Curran, not 20 until next month, sent back Root when he aimed to work to square leg, also had Brook caught behind for 17 and, in his second spell of the morning session, saw Bresnan snapped up at second slip for one. Leaning, having reached 20 in support of Bairstow in a sixth wicket stand of 67, was leg-before to Rikki Clarke, playing towards midwicket, and England keeper-batsman Bairstow’s only mistake in a morning of magnificent batsmanship was when, on 66, he got a leading edge trying to work a short ball from Dernbach towards mid-on and saw the bowler get his right hand to a difficult caught and bowled chance but fail to cling on. Clarke had Steven Patterson superbly held at gully by Ollie Pope for five and Bairstow’s counter-punching defiance ended when he tried to force Dernbach and edged to slip. Curran then ended a bright, career-best 29 from Shaw to wrap up the innings. Yorkshire, batting again 185 runs adrift, lost Alex Lees for four at the end of the fifth over when the left-hander pushed at Dernbach and edged to second slip, and it was 10 for two when Cheteshwar Pujara drove loosely at his third ball and lost his middle stump to Curran. Yorkshire opener Lyth said: “We have been outplayed so far in the game but Jonny and Jack played well in the last hour and Jonny batted brilliantly this morning. “If they can put a really good partnership together tomorrow morning then you never know. “The pitch is taking some spin now but it’s still a decent pitch.